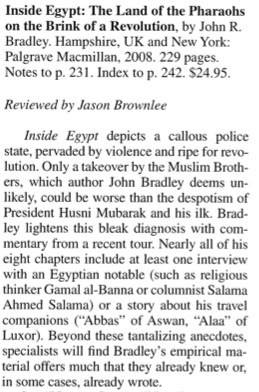 Only two books have come out in the last few years describing Egypt in the late Mubarak era: John Bradley's journalistic Inside Egypt and the more academic Egypt After Mubarak by Bruce Rutherford. Read the whole review here [PDF]. You can also read Robert Vitalis' review of Rutherford here [PDF], also in MEJ. I think the Rutherford book, from what I've read, even if quite dry at times makes a good contribution to the understanding of the judicial system in Egypt and a thought-provoking argument about liberalism and Islamism in contemporary Egyptian politics.